I had a difficult time coming up with a clever title for this post, so I settled on an oxymoron. In common usage, “grayscale” and “rainbow” are effectively antonyms. But I think it’s a reasonable description of what you see in this photo: shades of white light refracted by water droplets on a deck railing. Water droplets illuminated by diffuse light won’t produce the colors direct light does. 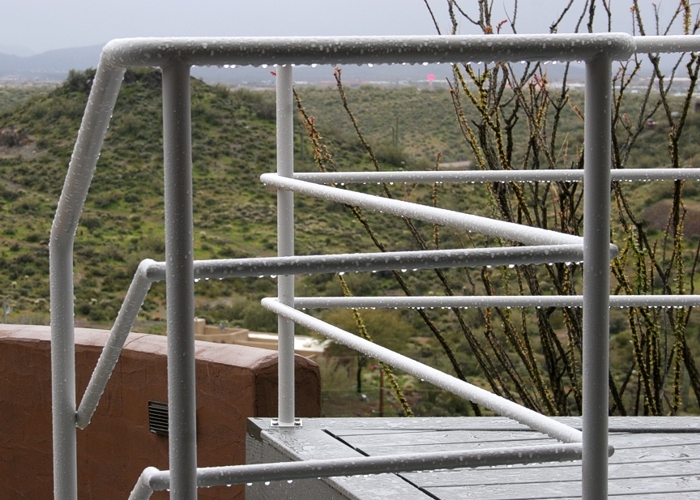 Compare the photo in my Oct 29, 2018 post Rainbow on a Railing. There, the Sun is shining through a gap in the clouds. Here the Sun is behind the clouds, and its white light is scattered and diffused by a gray overcast sky. 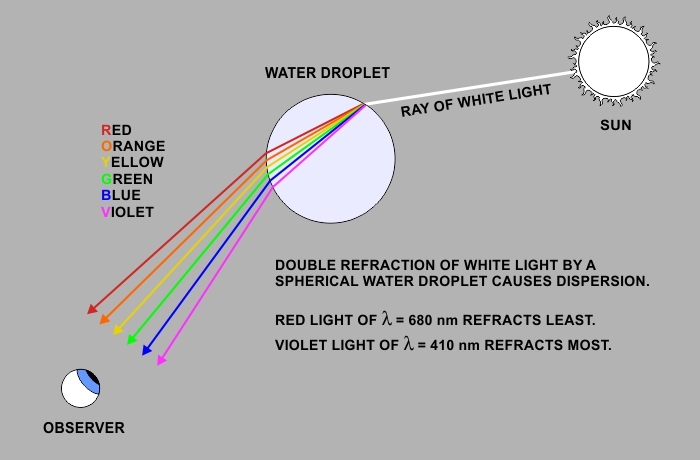 Every ray of light entering the droplet (at an angle other than perpendicular) will experience dispersion, but when the light is coming more or less equally from all directions, the spectra overlap and the light gets remixed back into white. When I took the photo, I considered using a bright spotlight to directly illuminate the drops for comparison, and I encourage you to try that experiment if the opportunity presents, but I already had my Rainbow on a Railing photo. What makes this photo so demonstrative is the high contrast between the bright drops and dark vegetation background. This was about an hour before sunset, so there was still lots of diffuse light available. Since the Sun is obscured, the entire sky acts as the source of light. Yet the drops look brighter than the sky itself. This is because the drops’ hemispherical shape focuses light like a convex lens. Interestingly, there really is a kind of “grayscale rainbow” but it’s official name is a fog bow. It’s produced by a different mechanism but looks like a rainbow with no (or very pale) colors. If you’re curious about that “pinkish” light just below the top railing, it’s an electronic billboard for the Outlet Mall located just west of the freeway. It’s the brightest light I can see from here at night and it casts shadows across my front deck. If you want to get a closer look at it, and read my rant about this recent technology, see my March 12, 2012 post Electronic Billboards.